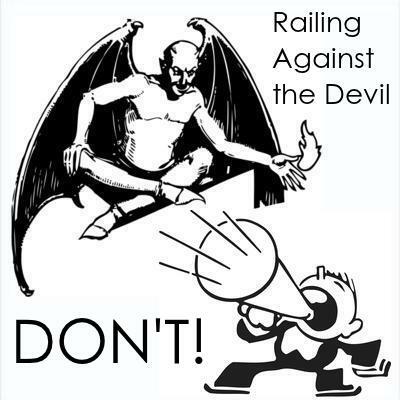 RAILING AGAINST THE DEVIL: Scripture says Don’t Do It. RAILING AGAINST THE DEVIL: IS IT BIBLICAL? Are believers to bring “railing accusations” against the devil? Everyone wants to bash the satanic–even those who do not believe in Satan–but Christians are warned not to do this. Some commentators use such actions as examples of human pride and hubris. Still, that hasn’t prevented our present ungodly generation from doing what the Bible says not to do. Believers are not to act like the enemy. But it’s a hard rule for those eaten up by pride: people loves to talk the big talk. Time for some good ol’ fashioned devil-stomping! 2 Peter and Jude both warn Christians of railing against that which humans “know not”–including the devil. Jude is especially clear on this point, going so far as to give a very clear example for the Christian to follow in this regard. 2 Peter 2:11 concurs that even angels don’t bring “railing accusations” against Satan. If Michael the archangel didn’t dare to do this, then humans should not either. Here’s what a few of the commentaries have to say on the subject of Jude 1:9. “railing accusation–Greek, “judgment of blasphemy,” or evil-speaking. 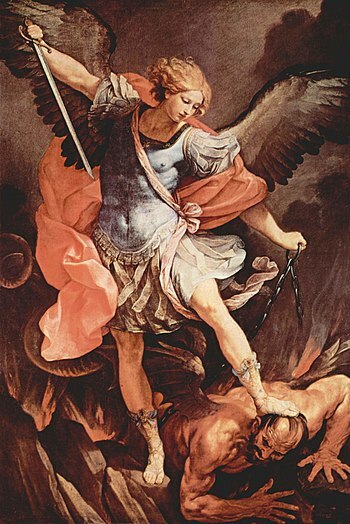 Peter said, Angels do not, in order to avenge themselves, rail at dignities, though ungodly, when they have to contend with them: Jude says that the archangel Michael himself did not rail even at the time when he fought with the devil, the prince of evil spirits–not from fear of him, but from reverence of God, whose delegated power in this world Satan once had, and even in some degree still has. From the word “disputed,” or debated in controversy, it is plain it was a judicial contest. This is a difficult verse, but the meaning seems to be this: The holy angels, who are represented as bringing an account of the actions of the fallen angels before the Lord in judgment, simply state the facts without exaggeration, and without permitting any thing of a bitter, reviling, or railing spirit, to enter into their accusations. Even the LORD himself–who cast Lucifer (as the devil was known then) from heaven and will ultimately cast Satan into the lake of fire–has only offered Satan as much as a rebuke (that we know of [Zechariah 3:2]). Many humans today exceed what it is written for even angels to do. Should we ridicule the devil or not? God operates in love and also in justice. He will execute justice against all those who hate him and are opposed to him. Even his Holy Angels don’t waste their time venting angry rants against the Devil for they know that their priority is to honour the Lord God and serve him only. Even those who believe in Jesus must follow suit and avoid going on a tirade against the Evil One and his minions but instead focus on faithfulness to Christ. Or else this can be an occasion to pride in onself. Remember, the Devil’s days are numbered anyway!